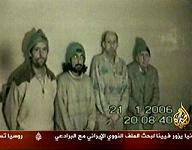 New York, January 29, 2006 – The first pictures since last November of the Christian Peacemakers held captive in Iraq shows the four men looking haggard and gaunt. The videotape, broadcast on Al-Jazeera Saturday (January 28) but dated January 21, was accompanied by the kidnappers' renewed threats to kill the men unless U.S.-led forces release all Iraqi prisoners. Friends of the prisoners continue to reflect on the irony that the shadowy kidnappers selected these devout peace advocates and open critics of the Iraq war to make their point. Other members of the Christian Peacemaker Teams, like people of faith across the globe, have not ceased praying for their friends or their kidnappers. The CPT released a message earlier this month, "We hope you are well . . . we light four candles every morning at worship." The missing Christian Peacemakers -- Tom Fox, 54, from Clearbrook, Virginia Norman Kember, 74, from London, England, James Loney, 41, a community worker from Toronto, Canada, and Harmeet Singh Sooden, 32, a Canadian electrical engineer from Montreal (above) -- have not been seen since they were abducted by dissidents who accused them of being American spies. The kidnappers, who call themselves "The Swords of Righteousness Brigades," set several deadlines in December for the U.S. to release its prisoners, but the deadlines passed without further word. "It takes courage and a profound faith to reach out with compassion to those who have harmed you," Kireopoulos said. "The Christian Peacemakers have shown that fragile human beings are capable of acting not out of resentment but out of love. They have lived into the roll of becoming the 'force that counters all the resentment.'" Similarly, religious groups are urging the release of journalist Jill Carroll who was captured January 7 and threatened with death unless all women prisoners in Iraq are released. The Council of American-Islamic Relations said Thursday (January 19), "We . . . call for the immediate and unconditional release of Jill Carroll, a journalist with a well-documented record of objective reporting and respect for both the Iraqi people and Arab-Islamic culture. We ask that her captors show mercy and compassion by releasing her so that she may return to her family. Certainly, no cause can be advanced by harming a person who only sought to let the world know about the human suffering caused by the conflict in Iraq." "Clearly the cycle of violence is resulting in more violence," Kireopoulos said. "This war must end." Please keep the members of Christian Peacemakers Team and their families in your prayers this week.